At this time last year I was harvesting no end of crabapples and managed to use them preserved in some form or another for the whole year. I discovered several varieties, all of which were a pleasure to cook with. 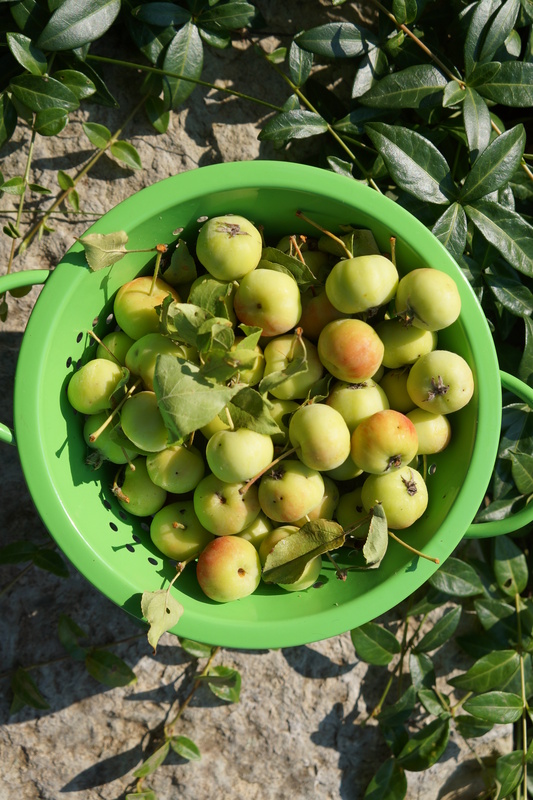 It became my favourite fruit – easy to pick and store, pretty, and useful in so many recipes – from spicy marinades to sweet treats. 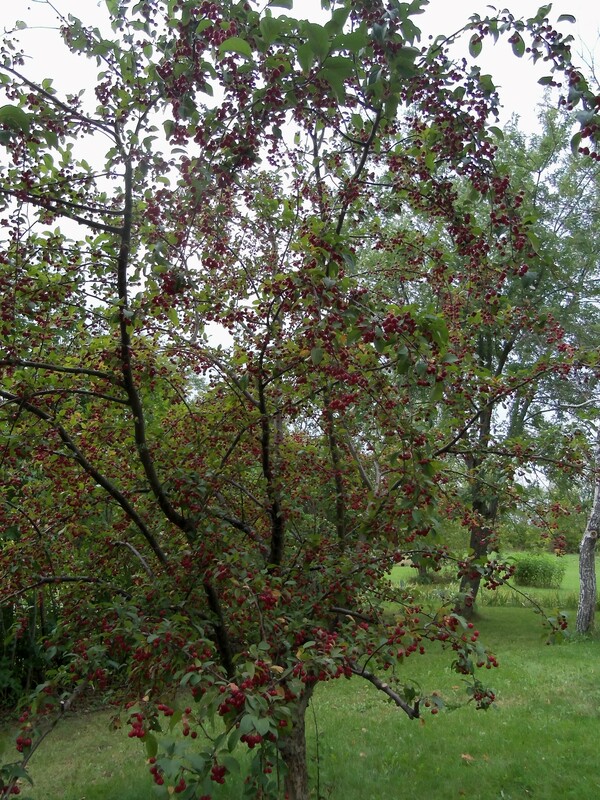 Some of my favourite recipes were: crabapple cordial; crabapple paste; biscotti; vinaigrette; chips. I was looking forward to finding more varieties this year, maybe planting a tree or two, and trying some new recipes. However, our one tree has so few fruits on it this year, I figure I will just let the birds have them all. Here is a picture of our tree last year. I did manage to collect some from a generous sister on a recent visit, enough to make a couple of new recipes. If you are lucky enough to have a source of crabapples this year, I hope you will find these recipes useful. The first I made was a jam mixed with rhubarb, which is still flourishing, and a little fresh ginger. 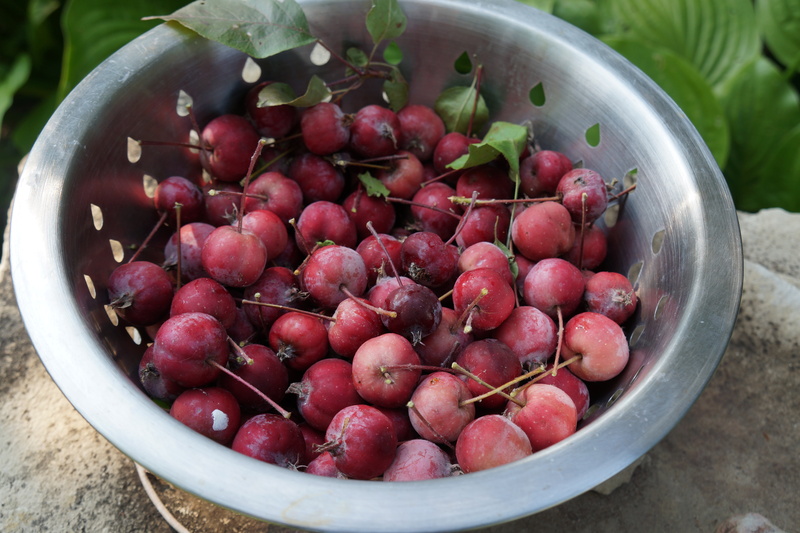 Crabapples are wonderful to mix with other fruit as they have so much pectin you don’t have to add any. I made it rather tart, but if you like a sweet jam, just add another 1/2 cup of sugar. I did not strain the crabapples after cooking, but if I can make this again I would because it would be better without the skins. The fruit is young enough the seeds are not a problem, but later in the season you will want to eliminate all of them too. Sprinkle the sugar over the rhubarb and set aside. Put the apples, ginger and cinnamon in a large pan and barely cover with water. Simmer until they are nice and soft, about half an hour on a low heat. At this point, I recommend cooling it a bit and straining it through a food mill or sieve. Return the strained juice to the pot and add the rhubarb and sugar. Continue to cook about another 15 minutes until the rhubarb is tender. Pour into 3 medium sized jars. No need to limit eating this jam just to toast for breakfast. It is also good with yogourt or with cheese. Categories: jams and jellies, preserving, recipes, wild fruit | Tags: crabapples, foraging, ginger, jam, Ontario, rhubarb, wild fruit, wild fruit preserve | Permalink. The wild grape vines this year are a bust. Not just mine, it seems to be the case everywhere in this area. I will be lucky if I can gather enough wild grapes for one good recipe. However, the leaves are still useable, and although some of them are too mature to pick, there are still enough young ones to use for cooking. 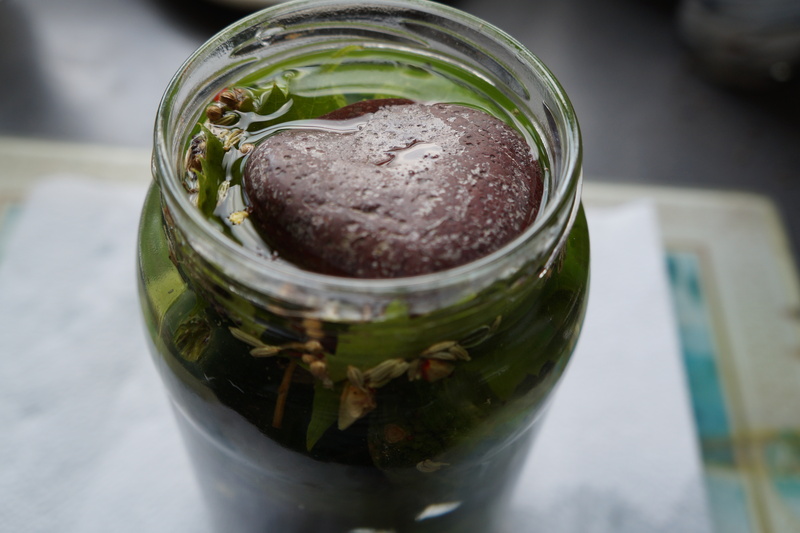 Now that it is pickling season, grape leaves are especially useful for adding to pickles you want to be really crunchy. A few leaves in each jar will prevent your crisp vegetables from going mushy. This is because grape leaves contain tannins which inhibit the enzyme that makes the vegetable soft. If you don’t have grape leaves, a pinch of black tea leaves, or a few oak or cherry leaves or horseradish will have the same effect. In order to test this theory, I decided to ferment cucumbers, which takes a few days but no extra effort. To do this you will need a brine made of 2 Tbsp salt per quart of water (non-chlorinated) and some flavourings, such as garlic, onions, herbs and spices. 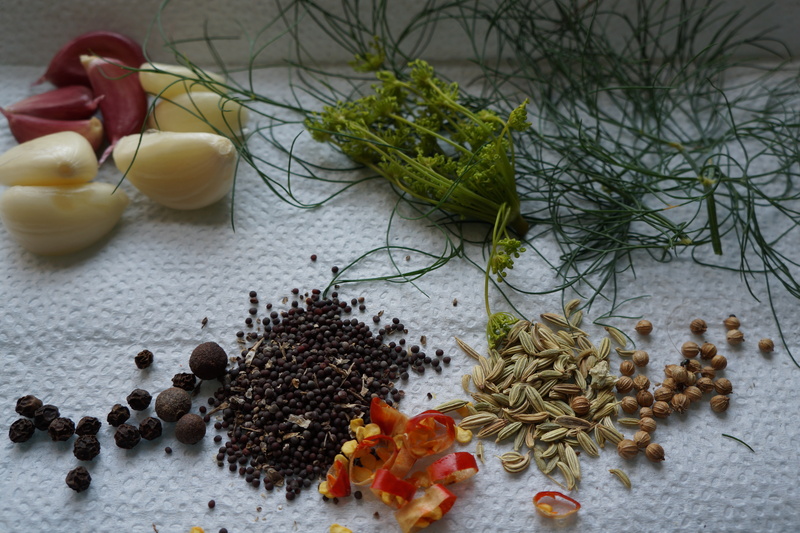 You could just use a ready-made pickling mix, but I decided to make my own mixture using primarily seeds, herbs and spices mostly from my garden. 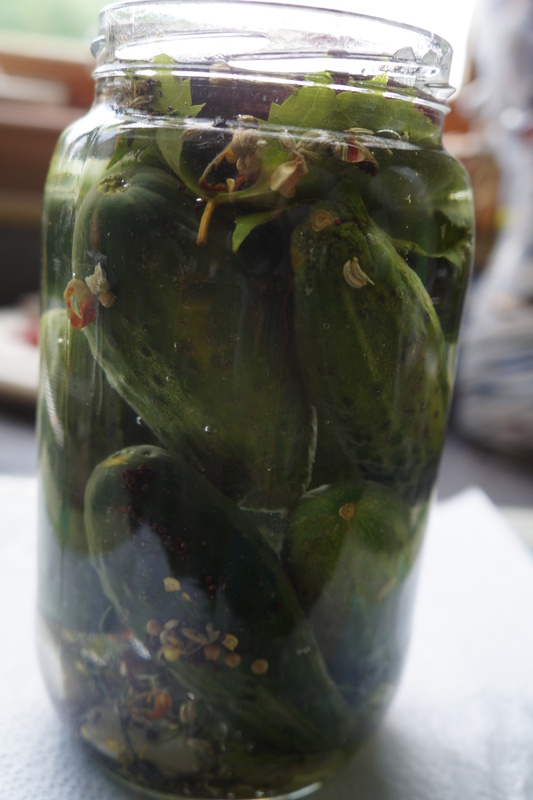 For one jar, I filled it with whole, small cucumbers, a few cloves of garlic, 3 allspice berries, 10 peppercorns, 1 chopped dried chili pepper, 1 tsp each of mustard, fennel and coriander seeds, and a few dill flowers and leaves. 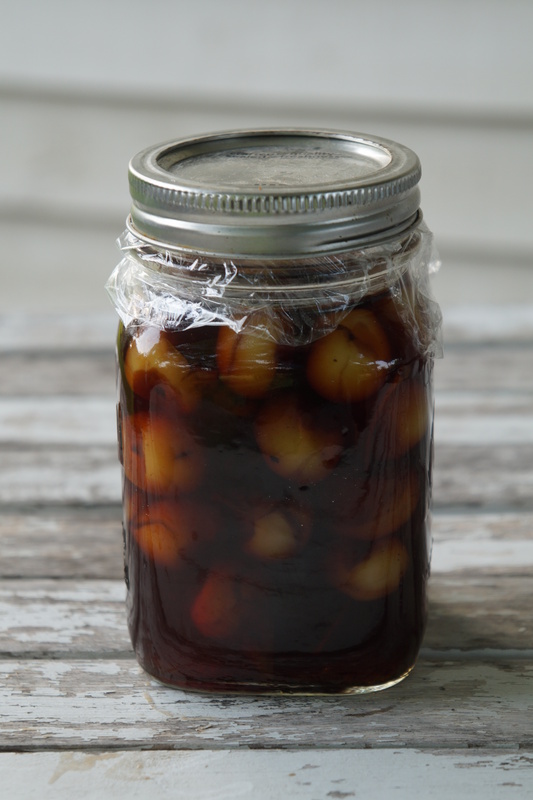 I used about 5 young grape leaves at the bottom and top of the jar, and covered it all with brine. The grape leaf on top prevents any of the other ingredients from floating to the top. 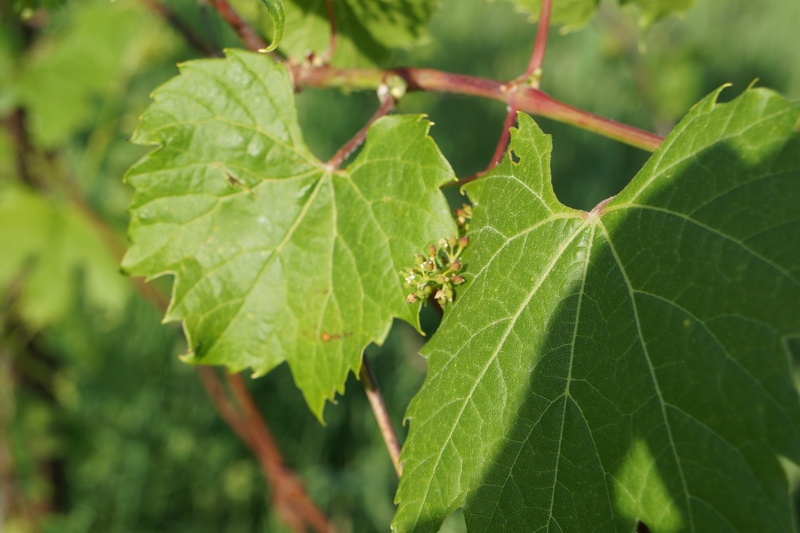 In addition, I placed a sterilized stone on top of the grape leaf to keep everything well immersed. I then covered it with a cloth and let it sit for about a week. When I figured it was ready by tasting, I put a lid on it and placed it in the fridge. 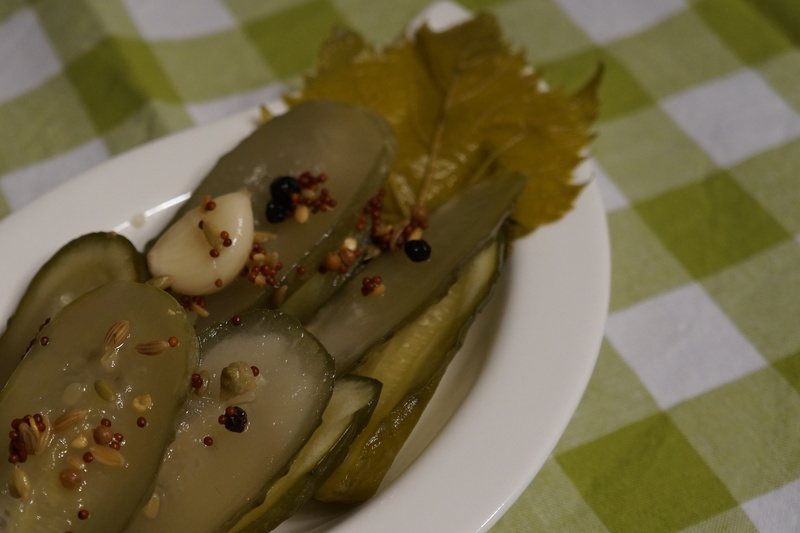 It will continue to ferment a little there, and I hope the garlic mellows out a bit yet, but the flavour and texture of the cucumbers was perfect. Categories: condiment, edible weeds, garden vegetable, preserving, spice | Tags: fermenting cucumbers, foraging, grape leaves, Ontario, pickles, spices | Permalink. I have also used it regularly in stews, sauces, dressings and pretty much anywhere where a bit of lemon or pomegranate juice would be called for. 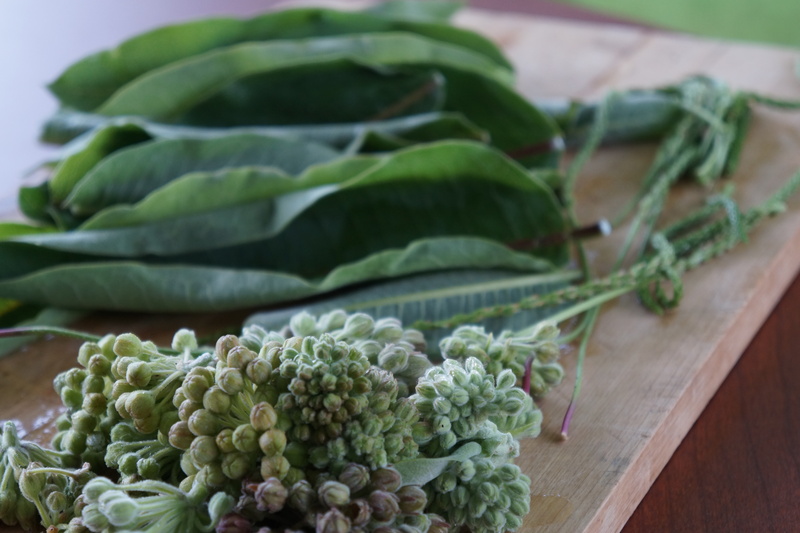 For anyone not familiar with this wild plant, at least not for culinary purposes, here are a few pointers. 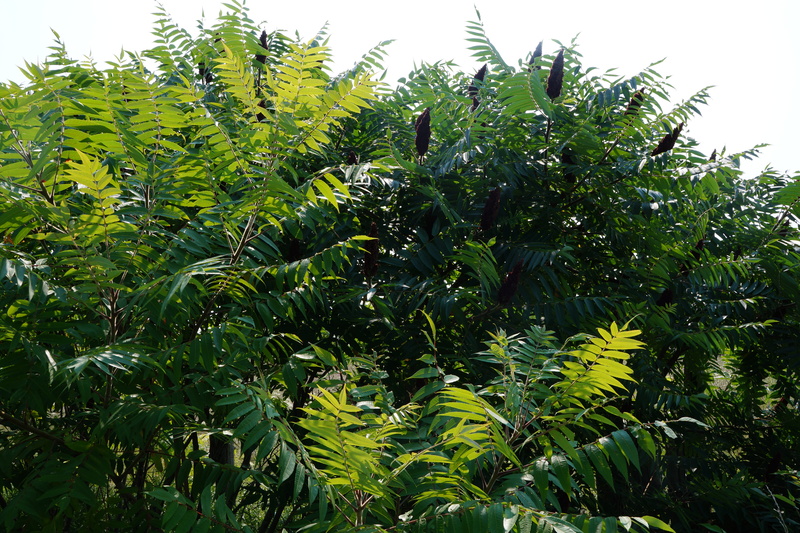 What is staghorn sumac? 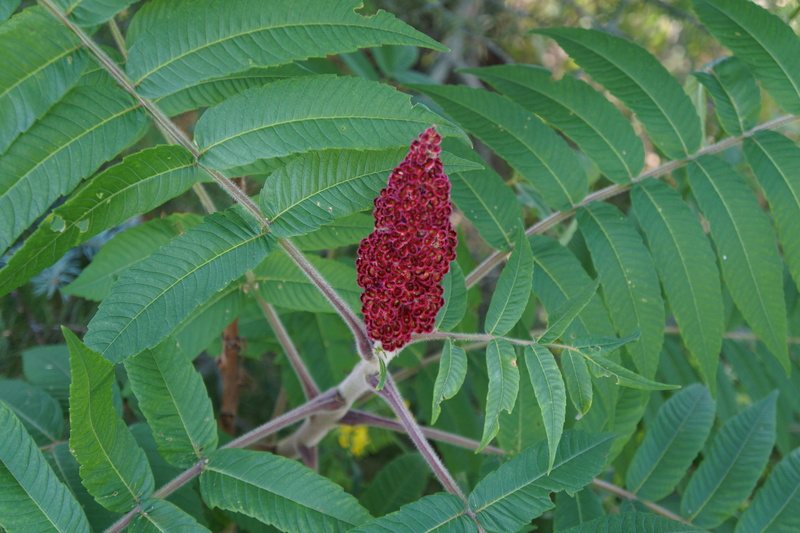 A shrub, also known as velvet sumac and sumac vinegar tree, it is of the genus Rhus and a member of the cashew family. It grows in most of Eastern Canada, and is used as an ornamental shrub in Europe for its fall foliage and distinctive fruit. How to identify it. 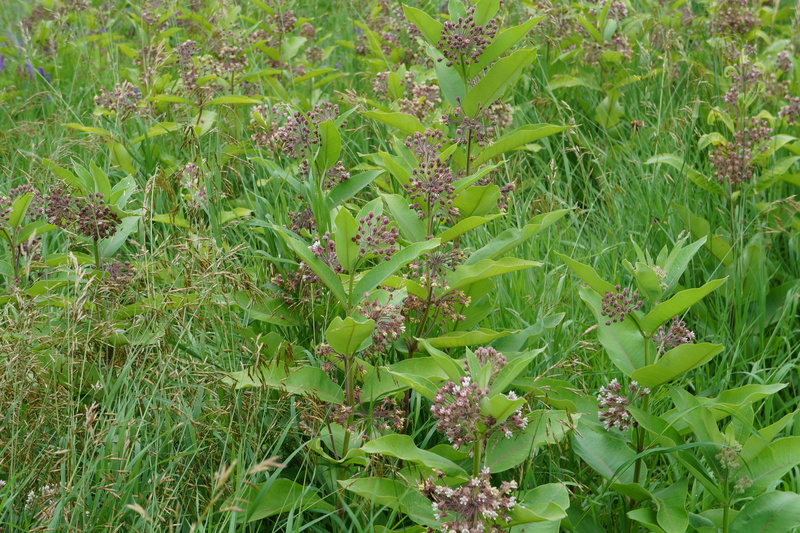 This shrub is between 1 and 8 meters in height and is commonly found along roadsides, at forest edges and in clearings. It has compound leaves with serrated edges. The flowers are cone shaped clusters with velvety buds. Its thick hairy branches resemble the horns of a male deer, hence the name staghorn. There are poison sumacs, but their leaves have no serrations and they have smooth white berries. How to use it. For sumac powder, remove the berries from the clusters and dry them in a dehydrator or an oven at about 170 F. Grind them and then sift them. For the juice, it is usually recommended just to soak the entire flower in water for a few hours, and for a more concentrated liquid, remove the flowers and add fresh ones to repeat the process until you get the strength you want. I have also simmered them to get more colour, although I might lose some nutritional value in the process. I decided to make a recipe for Angie’s Fiesta Friday #28 using the juice, which is most often used in lemonade-like drinks. I thought to mix it with rhubarb since now is the time that these two ingredients overlap for a few weeks. 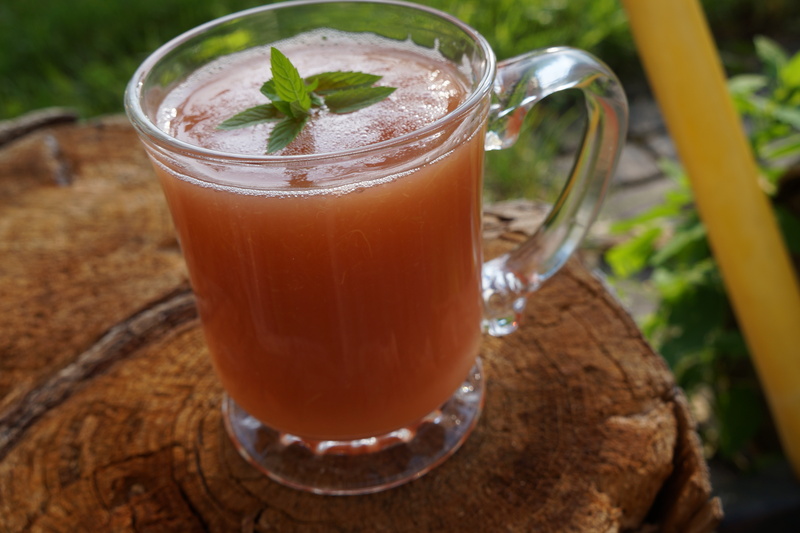 I have always liked the Scandinavian types of sweetish fruit soups, but if you are not a fan of such soups, you can serve it as a drink and call it what you will. However you serve it, it is a deliciously refreshing dish with a beautiful rosey colour. Simmer the rhubarb, sugar, cinnamon and water until the rhubarb is very soft. Strain and return to the pan. Add the cornstarch and simmer a few minutes longer. Add the sumac juice. Serve either hot or cold. Categories: beverage, edible weeds, soup, wild fruit | Tags: Fiesta Friday, foraging, Ontario, rhubarb, sumac, sumac recipes | Permalink.